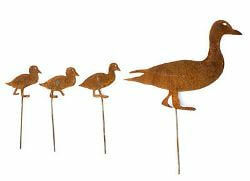 These Duck and Duckling Stakes are made from mild steel which has developed a unique rust patina. The mother duck stake is 400mm wide, sits 300mm above ground level with a stake that goes down 150mm into the ground. 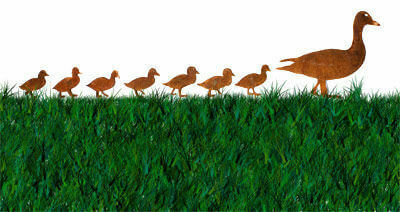 The ducklings are 200mm wide, sit 160mm above ground level with a stake that goes down 150mm into the ground.